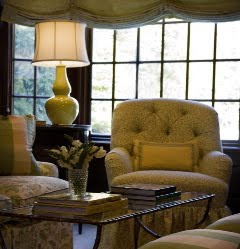 I'm going local with my designer crush today, Annsley Interiors here in Boston first came on my radar a few months ago when I saw her in the Boston Globe Article I was mentioned in as well. Since then I have been keeping an eye on her website at all the amazing spaces she has designed. You may have already heard of her as she's not just a local girl. She was featured in Domino in April 07 as one of the “Domino 10: Decorators on the Verge". Then then again in Traditional Home (April 09) Magazine’s “20 Young Designers We’ve Got Our Eye On”. Two major accomplishments if you ask me. 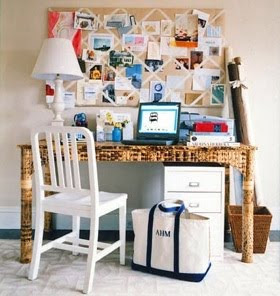 The same desk as the picture above- complete with a classic LL Bean Tote bag...oh so New England looking. 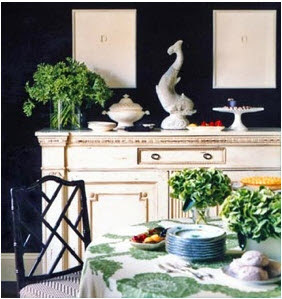 The mix of green and black here is great-I love the large print tablecloth and the classic bamboo chairs. 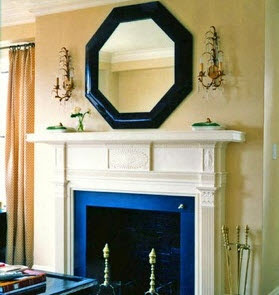 Her fireplace is beautiful- I want to get a new mirror like hers and those sconces are just the right touch of sparkle and glamour. 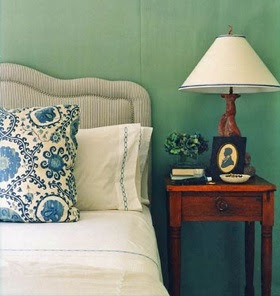 One of my all time favorite bedrooms, I love the wall color, the headboard, the throw pillow, the lamp and the little silhouette on the side table- its all gorgeous. Another bedroom in her house with the same mix. I really like the blue and yellow here. Two colors that if done wrong can look very baby room-ish, but here she does them with perfection. 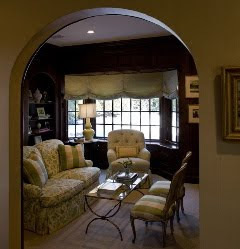 Here is another space from her portfolio- a beautiful West Newton home. 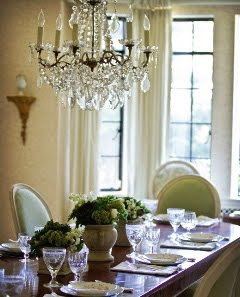 A pretty tablescape but what I cant keep my eyes off of is that stunning chandelier- I love it! There is lots more eye candy where these came from, be sure to check out her website HERE. Lots of talent! The dining rooms are great. And I too could use help with bookcases. So many great looking ones out there... just not in my house. Very beautiful work here. 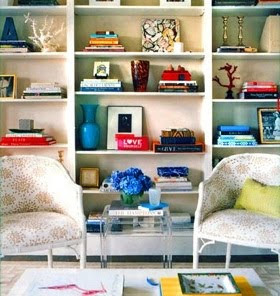 I love the bookshelf, chairs and lucite tables. And I love her work space. Look at that laptop though, it looks HUGE! *Kelly's outfit on Regis and Kelly is INSANE. So hot. Green silk top with to die for green shoes. Wow - everything is just perfect! Thanks for highlighting a local talent! For some reason I have a feeling she also nice! 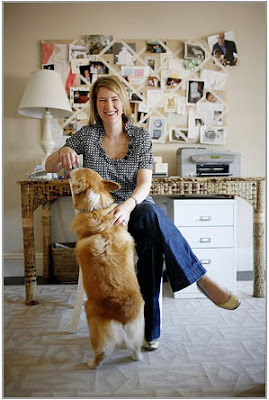 Her designs are very calming, I could imagine living in any of the rooms you showed. Beautiful! shut up, her website says she's from Nashville. I'm emailing her. She is soo talented! I love that she's local too (and her super duper amazing desk!). Thanks for the eye candy! i love every picture you posted; her style seems accessible but polished! thanks for the intro! 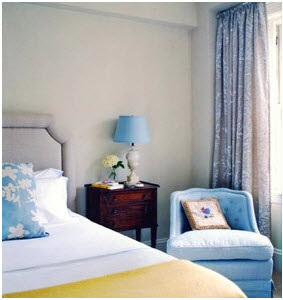 love the blues and yellows for bedrooms!! heeellllppp. How did you get your blog to be three columns? Do you have the file and will you be my blog bff and email it to me? I seriously cannot focus on anything because I want big, fancy pictures that don't go to photobucket when you click on the and three columns. p.s. My deer head was on my dining room table when I got home today!!!!!!!!!!!!! Oh, yes, lots of good stuff, here! I want to jump right inside! Love this post!! That is also one of my all time favorite bedrooms and I didn't know who the designer was. I loved seeing more of her work. Those blue bedrooms are SO pretty! 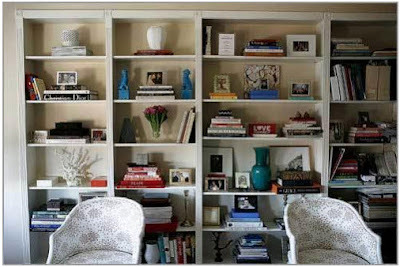 I'm with you on the bookcase styling - would love for her to come to my house, too. It was rather interesting for me to read the blog. Thanx for it. I like such themes and everything connected to this matter. I definitely want to read more soon. It is certainly interesting for me to read that blog. Thanx for it. I like such themes and anything connected to this matter. I would like to read a bit more soon.